The first step in understanding trends in auto credit is to look at the pool of US auto loans broken out by the borrower’s creditworthiness: prime versus subprime. Of course, the term “subprime” triggers alarming flashbacks to the global financial crisis. Subprime mortgages played a big role in the financial meltdown that ran from 2007-2009. However, we believe that the deterioration in subprime auto loans has less severe implications. Delinquency rates in subprime loans have indeed seen a significant deterioration. On the other hand, the data for higher quality borrowers looks much more like that in other areas of consumer credit i.e. delinquency rates are normalising, but remain at low levels. Despite headline-grabbing comparisons with mortgage-backed securities, subprime auto lending is quite a small pool. Subprime auto loans, at $270 billion, represent only a minority (25%) of total auto lending and a tiny proportion (2%) of the $12.6 trillion total in US consumer credit. Furthermore, investors should remember that not all lenders are taking the same levels of risk. Subprime auto lending has grown since the crisis, but the data suggests this has not been driven by systemically important banks or automotive captive finance companies or “fincos”2. The culprits behind the rise in subprime auto loans are primarily new entrants to the market: mostly private equity-backed non-bank financials (NBFs). 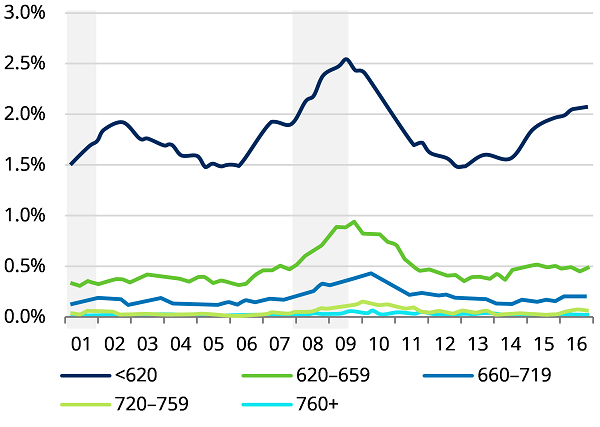 NBFs have accounted for the vast majority of sub-prime auto lending in recent years, and are even more dominant in the “deep-subprime” space: lending to those with extremely low credit scores, or none at all. Meanwhile, established lenders have actually been pulling back from this part of the market, with new lending by market leaders Santander Consumer and Ally Financial down 25% in Q4 2016. Federal Reserve surveys show tightening bank lending standards in auto loans since early 2016. Automotive fincos have very modest exposure to subprime. Some NBFs will likely come unstuck when we experience an economic downturn (or sooner), but mainstream lenders should be relatively well insulated. Because the Fed funds rate ultimately influences many other market interest rates, a variety of interest rates exist, from the higher car note rate to the rock bottom return on your bank savings account. Additionally, the Fed funds rate influences the prime rate, the interest rate awarded to bank customers with the best credit, which is tied to various loans and savings account yields. Today, the prime rate is 4.25 percent — the highest level of the year and 3 percent above the fed funds rate. You can estimate the prime rate by adding 3 percent to the fed funds rate. Since January 2017, the Fed has raised rates three times, bringing the important interest rate to a range of 1.25 and 1.50 percent. The low 4.1-percent unemployment level and continuous growth of wages support this federal funds rate projection. But don’t expect rates to stop there: In her recent speech, current Federal Reserve Board chair Janet Yellen stated the Fed’s goal of reaching a 2-percent inflation target. Looking forward, next year’s interest-rate forecast includes three quarter-point increases and two increases in both 2019 and 2020. Find out how these interest-rate boosts might affect your finances in 2018. Retirees and savers are tired of the low-interest rates and are looking forward to the Fed raising interest rates. Despite the modest rate increases this year, the average money market savings account rate remains a paltry 0.11 percent, according to the FDIC. Fortunately, an interest rate hike should slightly increase savings account rates, according to a recent MarketWatch article. But don’t expect to make a fortune using a savings account as your only growth tool. For the best rates, you might consider seeking out promotions at online banks, which have lower overhead and can offer higher rates than traditional banks. For example, if you invest $5,000 in a one-year CD at online Ally Bank, you can expect to receive 2.10% APY, which is far superior to the current national CD rate of 0.36 percent. If you deposit more money, you can earn an even higher rate. Getting a car loan seems relatively straightforward. You figure out how much you can afford to pay each month and how many years you want to be paying it. You shop around for the best loan deal you can find and get pre-approved. Then you pick out your car, finalize the loan, and drive away. Easy, right? Well, yes—if your only goal is to get any old car loan. But if you want to get a good car loan, there are a few more steps you should take that will save you money and keep you in control of the process. Start by reviewing your credit report and score. This will help you get a rough idea of what interest rate you’ll be charged for a loan. See if there are any negative or derogatory entries on your credit report that can be eliminated quickly to boost your credit score. Better credit = better APR. Take a close look at your finances. Your income and monthly expenses, rather than your desire for a cool new car, should drive your decision about how large a loan to seek. Some experts recommend that you spend no more than 10% of your after-tax monthly income on a car payment, but this rule of thumb is subject to a number of other factors. Do you live in an expensive city? What do your monthly bills look like? Are you buying a car that will be especially expensive to insure or maintain? Be conservative in estimating how much you can pay each month—and don’t forget to factor in insurance, maintenance, and fuel. Calculate how much of a loan you can safely afford, given your credit history, your income, and your expenses. There are a number of car loan calculators that make this process easy. Figure out how to make the largest down payment you can. Putting more money down will lessen the likelihood that you will be underwater on your car loan. A larger down payment may also reduce the interest rate you pay on your car loan and save you a great deal of money. Armed with this information, your next step is to shop for a loan. And “shop” is the right word here. An auto loan is a major purchase, one that you’ll likely pay thousands of dollars for. Treat it as such, not as simply a means to getting car of your dreams. Check with both the banks and credit unions you do business with, and also with those you don’t. Consider online car loans, especially if your credit is less than stellar. Also, make sure to ask yourself the following: Are there prepayment penalties? Are there origination fees? Can payments be made online? And—this is important—do all your loan shopping in less than two weeks. Why? Because credit bureaus knock points off your credit score every time someone does a “hard pull” of your credit history. But they treat a cluster of similar inquiries made within a two-week period as a single inquiry. In other words, they don’t penalize you for shopping around, so long as you do it quickly. Be aware that many dealers may try to sell you a more expensive vehicle than is prudent for your budget. And they may also offer their own in-house financing deals to make it easier for you to buy a pricier vehicle. Typically, though, these deals that look wonderful in the salesman’s office come with longer payoff terms. And that means paying more interest. Not all dealer-assisted financing is a bad deal, of course. Sometimes dealers will have access to financing options that individuals do not. But be wary. A loan is only a better deal if it costs less over its lifetime. More and more car insurance companies will soon start offering usage-based car insurance (UBI). In a UBI plan, a mobile phone app or other sensor will track how you drive and calculate the rate the company charges you accordingly. This usage-based insurance will also be affected by when, where, and how you drive, with more and safer driver discounts for avoiding accidents. And it’s not just established companies that will benefit from this trend — more and more startups will be getting into the UBI game. Many smartphone apps already allow individuals to compare quotes from different companies. Others, like Metromile, offer a flat base fee and then charge users based on how many miles they drive. Another, Cuvva, is car insurance marketed to infrequent drivers. Alternatives also use smartphone GPS technology to provide insurers with tracking, vehicle health reports, and tips for users. Many of these will benefit both consumers and insurers: one, TrueMotion, measures distracted driving, rates each trip and shows where drivers have room for improvement and claim to have reduced distracted driving by up to 75 percent with its users. Mojio is another that has already partnered with big names like Google, Amazon, and Microsoft — the technology is a leader in the future of connected car services. For those who are looking to provide more innovative services, useful and user-friendly apps, seriously custom pricing models, and data-centric strategies will be critical for success in the car insurance industry. In many industries, “push” advertising has been dominant for decades. Push advertising force-feeds potential clients with flashy and catchy advertisements and marketing — think Time Square brightly lit by ads galore. More and more, the car insurance industry will be dominated by those who truly understand what it takes to “pull” customers in (or away from a competitor) rather than “push” them towards a product or service. Push is about exposure — pull is about understanding the unique needs of individual potential clients in a broader context. In order to be successful in the new era, insurers need to truly understand their client’s lives. Insuretech can help by providing data and context to individual drivers and the ecosystems in which they exist. This, in turn, will allow insurers to better understand the unique needs of clients — and in turn provide better, more individualized products and services. Gone are the days when paying an arm and leg for car insurance was an individual’s only option. Between car sharing services such as Uber, Lyft, and Gett and better public infrastructure in the nation’s largest cities, even driving a car is now optional for many people. But for those who drive, innovative applications, technology, and pricing models mean competition is fierce — and buyers are driving more than just their own vehicles. In addition to providing them with better data on their own driving, technology allows drivers to have fine-tuned expectations of how much they should be paying for car insurance based on their driving behaviors, vehicle make and model, the city in which they live and work, and their other traditional risk factors (like traffic tickets, age, etc). New Hampshire is in a league of its own. Although the state’s average annual premium of $733 is below the national average of $841, it more than makes up for it with a 65.9% rate increase after filing one claim, the highest percentage increase in the nation. After the rate hike, premiums in New Hampshire average $1,216. For overall premium cost, however, Rhode Island has New Hampshire beat. After just one claim, America’s smallest state has the seventh-highest average premium at $1,066 thanks to the third-highest percentage rate increase of 61.7%. That means drivers in Rhode Island will pay an additional $657 per year on car insurance after one claim, the highest increase in the country dollar-for-dollar. When looking at our chart, an interesting pattern emerges—all of the largest increases in premiums occur in states that start out with higher premiums, even without any claims having been filed. In most of the states where the premiums start out below the national average, their average rate increases are also lower. Unfortunately for drivers in states like Texas (53% increase after a claim) and Connecticut (43.8%), their premiums start out high and only get worse. Other places, however, start out so low that, even though they have a big jump after a claim, their premium still isn’t too bad compared to some of their neighbors. In Iowa, for example, our hypothetical driver starts out with a premium of $572. After a claim her rate is increased by a whopping 56.5%, but she’s still only paying $895 every year. BATON ROUGE – For a fourth straight year in a row, Insurance Commissioner Jim Donelon says residents in Louisiana can expect increases in their auto premiums. In some cases, it may be a double-digit increase. 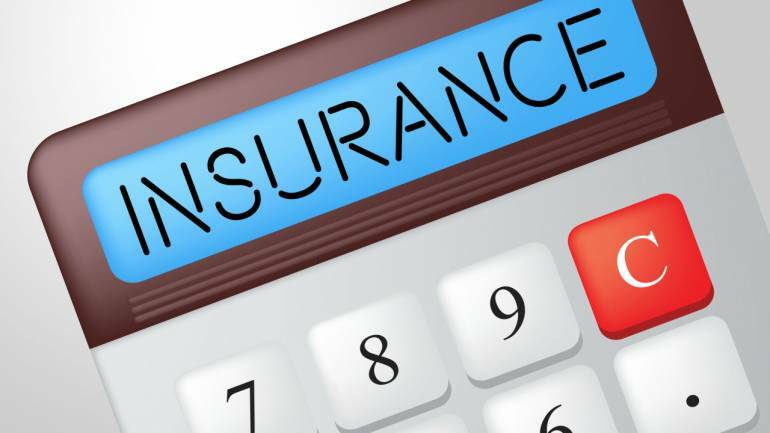 The increases can be blamed on a host of factors that ultimately boil down to the auto insurance industry not being a profitable business right now. Lou Fey is the President of the Professional Insurance Agents of Louisiana and Chairman of the State Property Casualty Commission. Fey said currently, Louisiana is the second most expensive state for auto insurance in the nation. Michigan is number one. Fey believes rates are going up due to distracted driving and the need for tort reform in Louisiana. According to statistics from the National Highway Safety Commission, there were 3,331 deaths across the nation last year due to distracted driving. It’s why professionals are proposing a bill in the legislature that would make it illegal to hold your phone in your car unless you’re using hands-free technology. All auto insurance increases must be approved by Insurance Commissioner Jim Donelon. Donelon said before an increase is granted, a team of actuaries analyze numbers submitted by the insurance companies. According to Donelon, very seldom does his office approve the hikes his insurance companies request. In the past two years, five companies have left due to the unprofitability of the auto insurance industry here: 21st Century North America Insurance Company (part of the Farmers Insurance group) (2016/2017), ACCC Insurance Company (2017/2018), Auto Club Family Insurance Company (2015/2016), Direct General Insurance Company of Louisiana (2018) and Equity Insurance Company (2017). Donelon said more companies writing policies increases competition. Nancy Taylor is a Baton Rouge driver who received sticker shock when she received her renewal in the mail. Her policy increased nearly $300 for six months. Taylor was involved in a minor fender bender that caused no damage to either vehicle, but the driver of the car she tapped claimed bodily injury. Her accident was forgiven and not reflected as part of her $300 increase. However, she said her insurance company paid the person in that minor crash $2,500. Taylor said reforms need to be made so people aren’t saddled with the exorbitant bills. According to Commissioner Donelon, Louisiana is considered a working poor state. About half of the drivers on the road are carrying the basic liability coverage just to drive. Startups put together by neophytes in cramped basements are probably not going to be the exciting stories in 2018. Could it be about consolidation around companies that have been around for three years or more and have achieved scale? Are the investors likely to come from banks or ecosystem players like Ant Financial instead of traditional sources of startup funding? Banks seem to be more sure of themselves. They still have legacy cost structures but are dismantling them rapidly. Innovation could come as much from within as from outside. This is an interesting one. Easy to get people to sign up for a digital bank account. But for those who’ve toiled in the trenches of customer lifecycle management, getting people to trust you with their money is not the same as getting them to use a chat app or a telco brand. Is it that the handful of digital bank players which are led and/or advised by banking and payment practitioners are more likely to succeed than the next cool looking app linked to a prepaid card? Banks are building substantial digital banking business models that are premised on a reinvention of the model from the ground up. Automation of backroom operations, AI-based lifecycle management and credit scoring, KYC based on biometrics and integration with national ID databases, blockchain based reconciliation and validation. And of course, the cool looking front-end app and web interfaces. Does it look like the odds are that traditional banks going truly digital will see more traction and success in 2018 versus neo-bank disruptors? Will it pay to go cashless? Yes, of course. But even in the more advanced economies of Western Europe, cash still accounts for over half of payments (Nordic countries apart). This is despite overwhelming evidence that the cost of accepting cash is roughly twice that of accepting electronic payments (Survey on Merchants’ Costs of Processing Cash and Card Payments, European Commission 2015). It does not help that attempts to take cash out of the system have been via some not-so-convincing user experiences. The Reserve Bank of Australia reports indicate that mobile device-based contactless payments are declining versus plain vanilla contactless cards. On occasion, many of us have fiddled around with our phones at grocery checkouts and petrol pumps to make payments. And then there are payments based on QR code, sound, biometrics. Based on these trends, does it increasingly appear that card-based form factors including contactless and location based payments, like the Amazon Go experience are more likely to succeed? No doubt, there are brilliant new players in Lending and Crowdfunding. A couple have been featured in this column. Excellent value propositions and consumer experience. The challenge is two-fold – awareness and trust. There are companies that are built on solid propositions and are well governed by excellent central banking regimes. However, scale is an ongoing challenge. Perhaps the market will develop as a number of small lending startups, each with its niche segments. These will consolidate over time, similarly to the path that banking has taken in some parts of the world. Will traditional banks increasingly lend credibility to startups as is happening already or will the ecosystem players like Facebook and WeChat become alternate sources of consumer credit? Are you likely to borrow from either of them for a new car or even a house? Will machines personally manage your finances? It depends. Would it boil down to which set of algorithms is better? One entity’s gain is another one’s loss. Therefore how do we as individuals decide which machine is better to trust? As long as there are human factor-based inefficiencies i.e. operational as well as intellectual, the vision of logic-driven algorithms is attractive. Take the human factor out and will we end-up with a bunch of machines playing digital chess with our hard-earned money? Is that a possible scenario? Or are there enough checks and balances in the system? What do you think? Will customers relate to machine management? How many of us have got frustrated with Chatbots that get into really odd conversations – “I do not understand that word. It seems like you are getting angry. May I help you?” Some of the bots out there are merely today’s version of Interactive Voice Response trees. Combined with well analysed data, these could be really powerful tools. Despite the promises of efficiency and singularity, it just seems so much better to have a real human voice at the other end of the line or chat. Inefficiencies, mistakes and all. Somehow, there is a species-level familiarity. At the summit, Thomas Sargent gave a keynote speech titled “How Do Artificial Intelligence and Blockchain Create New Opportunities and Challenges”, and stated repeatedly that artificial intelligence (AI) and blockchain would be promising in the future. According to him, blockchain is a reliable technique for the financial system, since it is a very stable system that is not randomly formed, but based on all the previous e-signatures created. It provides good technical support for the overall financial system, and is an exciting technology for investors. “China currently is a gathering place for talented people, especially young people proficient in statistics and computers. I believe that AI will gain a foothold and achieve integrated development in different companies and organizations,” Sargent said. Regarding investment opportunities in 2018, Qiu Sisheng, the chief economist at Neo Capital and Vice President of Neo New Wealth, pointed out that the coming year would be the best time for China. Wealth would be redistributed in the next five years, not in the real estate market, but rather in the equity market. “It has been said that Chinese real estate market will no longer be the place for wealth creation, while the equity market will be. Why? When urbanization attains a certain height, real estate will no longer bring about high profits, but equity will still be vibrant, so equity allocation will be very important in the future,” Qiu Sisheng said. In recent years, driven by the real economy and financial markets, the number of high-net-worth individuals has been increasing in China year by year, bringing about enormous demand for wealth management. In addition, according to market data, an increasing number of high-net-worth individuals that usually make big investments are making decisions with advice from investment institutions. Over 70% of the investors that make investments of over 3 million yuan cooperate with professional institutions. As their demands are increasingly diversified and integrated, high-net-worth individuals are seeking increasingly professional financial services. According to Qiu Sisheng, professional institutions will surely cut a conspicuous figure in China’s wealth market. Especially as high-end investors put forward diversified, integrated and individualized demands for investment, third-party wealth management organizations that aim to meet customers’ financial demands have a brilliant future. However, before banks even think of opening up their systems to newcomers, they need to first untangle their old and inefficient infrastructure and streamline their core banking processes. Each API should then be designed to sync up with the core architecture. The problem at the moment is that every bank is defining its own set of APIs, thereby hampering connectivity, easy integration and openness, which sort of defeats the purpose. There is currently no universally adopted reference model or taxonomy to lay out clear standard definitions for all the various banking business functions. Without this, it’s almost impossible for banks to visualise the different information flows within all the banking capabilities within their model, let alone how these are connected and which should be taken up for API enablement. Following on from this conversation, banks will then also need to decide whether to keep these various business capabilities in-house, or simply consume them off the cloud as and when required. Without clear sight of what they have in play at the moment, how can they possibly move ahead? A global standard and model for API development will be crucial in taking this innovation forward and allowing banks to realise their full potential. PSD2 is a European directive, though I hope that it will be the prompt that the international banking arena needs to start really looking at these challenges on a global scale, and in earnest. Rather than waiting to see whether the regulation itself travels beyond Europe, banks outside of this jurisdiction should address the opportunities presented by open APIs today. Regulatory push apart, there are strong business compulsions for bringing about standardisation and interoperability among APIs en route to open banking. Aside from the ‘building block’ approach to innovation that this technology affords, there is a huge opportunity for banks to start embracing partners from overseas. The problem of tangled and complex systems through years of layering on technology products is by no means limited to Europe. This issue is particularly prevalent for Islamic banks for instance, which have traditionally developed tailored, in-house banking technology systems to ensure they comply with Shar’iah, Islamic legal code.